The Long Winger, a person who hunts with a true falcon, whether it is a Peregrine, Merlin, Saker, Gyr or any of the other types of falcon readily bred in captivity. These birds catch their prey whilst it is in flight. The Short Winger, a person who hunts with a Hawk or an Eagle, whether it is a Harris Hawk, Goshawk, Red Tailed hawk, Sparrow hawk or Golden eagle, Tawny eagle etc. These birds mainly catch prey that is on the ground. The long winger is known as a Falconer and the short winger as an Austringer. German shorthaired pointers have, over the years, proved their abilities in both forms of falconry. The long winger can again be separated into the hunting style adopted and prey taken. Flights can be split into Pursuit Flights, Stooping Flights and Ringing Flights. Pursuit flights are typically straight from the fist with no dog involvement, perhaps after Gulls or Corvids. Large distances can often be covered and wide open expanses best suit this form. The element of surprise is essential; the falconer must try to position for a down wind slip; the falcon instinctively singling out its prey from the startled flock. Stooping flights involve a pointing dog; quarry includes Pheasant, Partridge and Grouse. With the dog on point a falcon is un-hooded and cast off, the falcon will fly up in a spiral above the dog until it reaches its ‘pitch’, its maximum height for the conditions. The falcon then waits on until the falconer chooses to flush the quarry. All eyes are on the falcon which will stoop with wings folded, guillotining its fleeing prey from the air. Pitches of 600 to 800 feet are the norm; weather-permitting heights of 1000 feet lend to a breath-taking spectacle. Ringing flights are a combination of pursuit and stooping flights and can involve a pointing dog. Traditionally Larks were hunted with Merlins and historically Herons were hunted with Peregrines. The prey is flushed and the falcon released from the fist to tail chase the quarry skyward in a ringing, circling motion. At the prey’s maximum pitch it will give up climbing and attempt to return to earth to flee the pursuing falcon. As the prey tumbles the falcon turns and a spectacular stoop is displayed. The short winger only has pursuit or soaring flights available. Pursuit flights either straight from a tree or from the gloved fist or the bird cast off into a headwind and encouraged to follow the falconer. We can split the hunting techniques up by the type of game. The hunting techniques for Rabbits, Hare and Game Birds (Pheasant and Partridge) vary. Rabbiting By Ferreting is made so much easier if it involves a ‘Homing’ pointer. The dog is asked to sniff at every rabbit hole and will point (‘Home’) when a rabbit is at home. The Austringer will call the dog away and introduce a ferret into the rabbit’s warren; the ferret will then work feverishly until it bolts out all the rabbits; the hawk on the fist or up a tree, reacting at lightning speed to pursue, and bind to the fleeing rabbit. The dog is in sit stay and stays put; there is no place for a dog that chases the hawk chasing the rabbit! Rabbiting by Walking Up is very similar to rough shooting. The dog is left to quarter freely in front of the hawk in open woodland or grassy areas with the rabbits hidden to the human eye but not the dog’s nose! The bird soon learns that a pointing dog means prey and the ensuing tail chasing flights with the rabbit often having to run a long way back to its warren are breathtaking. A steady dog, that does not chase is essential. Pheasant and Partridges involve exactly the same techniques as Rabbiting by walking up, the dog is an essential part to maximise the chance of finding quarry. The Austringer’s goal is to catch the pointed game bird in the air with the hawk sweeping the prey down within the grip of its powerful talons. These flights tend to be very fast. Goshawks are normally flown at game from off the dogs point. Slower Harris and Red Tail Hawks rely more on a swoop from a high vantage perch to catch a fleeing pheasant or partridge. Hare hawking the success of this form is very dependent on the wind direction when flying Harris or Red Tail Hawks. These hawks when flown with even the slightest wind in their face struggle to make any ground. With hare hawking it is essential to have the wind behind the bird, i.e. a down wind or a cheek wind ‘flush’, and hope the hare runs the right way! Fields are walked in straight lines, the dog at heel when walking down wind, relying on the hare sitting tight, or being sprung close to the line of hawkers. The dog would then be used to quarter back the same field into the wind to hoover up any missed hares. If a point arises it is essential that the hawk is moved quickly in a wide berth in front of the dog and the hare pressured to run down wind. A steady dog is essential, when the bird is ‘slipped’ the Austringer runs in order to grab the hare quickly to minimise the chance of the 2lb hawk being kicked off by the 8lb hare. The dog must sit stay after the hare has flushed or run to heel with the Austringer! Flights on flat land can cover many hundreds of yards, the hare using every trick in the book to shake off its determined pursuer. Soaring flights are suited to the broadwing hawks and eagles, rather than goshawks. The bird is cast into a headwind and encouraged by hunting success, to follow the falconer’s dog, until a point is held and flushed. The height of the bird is not as essential to the success of the flight, as with the falcons. The resulting stoop and swoop are stunning, a 2lb hawk hitting its prey at speed leads to success, and success leads to a very confident and fit hawk. Again though the land is essential, a large amount of ground can be covered, and telemetry is essential. A truly natural way to hunt these naturally soaring birds. Sparrow hawks, are too small to hunt rabbits, pheasants and hares. Partridges can be taken, but this incredible little bird excels at corvids, taking crows, rooks and magpies in flashing pursuit flights from the fist. Today falconry combines traditional methods and equipment with modern technology. 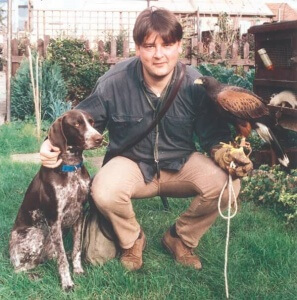 The falconer will still tether his birds using traditional leather anklets and jessies and fix a brass bell onto its tail, though modern electronics have led to the development of telemetry systems for the birds and dogs and even the ferrets! Simple transmitters, using a battery, a crystal and fine aerial are fitted onto the charge. A tuned receiver allows the falconer to track a wayward bird over large distances, up to 20 miles line of sight! The same technology can be used to track ‘ranging’ dogs and trapped ferrets. Weighing scales are essential. Birds will hunt best at a particular weight. 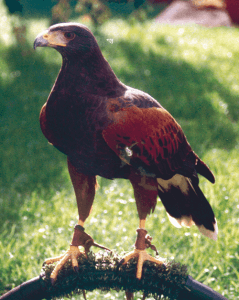 With a 7oz Sparrow Hawk this can be within 1/4oz; for a 15lb Golden Eagle it can be within 8 to 12ozs. Weighing scales allow the falconer to accurately log and compare the bird’s daily performance. The versatility of the GSP to adapt to different field surroundings coupled with its gentle intelligent demeanour around the home make it ideal for working with birds of prey and the Falconer or Austringer should feel privileged to own this adaptable dog. The GSP has the tenacity to run all day in search of the scent that will stop it dead in its tracks and cause every muscle in its body to ripple in anticipation in the classic pointing pose. Then, with liberal encouragement during the controlled flush, the dog sits as the hawk tears off after the quarry, the dog shaking in excitement as it watches the course of the flight, just in case the hawk misses, and it is sent for a re-point and flush.